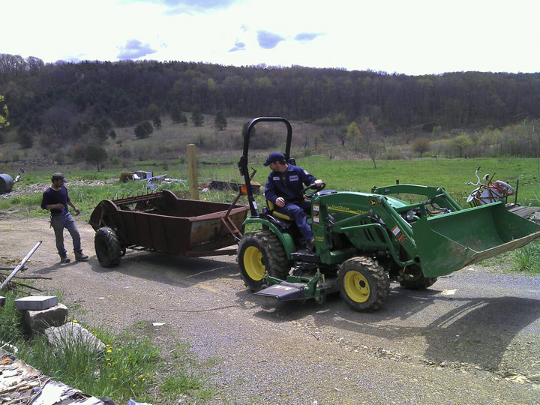 There’s a new tool on the farm, one that’s been needed for far too long: a John Deere tractor. Now that it’s finally here, it’s time to get serious about spreading manure. The manure spreader has been on the farm as long as I can remember, but it was never much use without a tractor to get it moving. 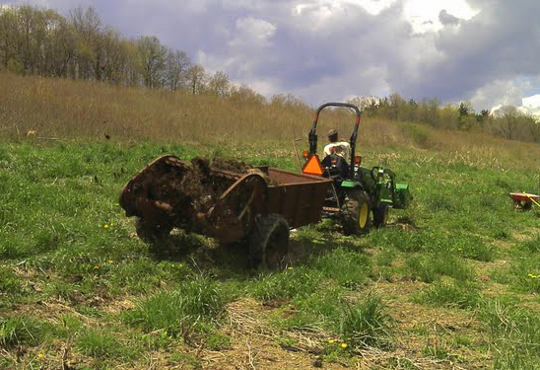 Before we could use the spreader, it needed to be oiled up, and prepared to work. The machine has been sitting idle for years, so we had to knock off some rust here and there, add air to the tires and replace a few pins. The bucket on the front of the tractor is very useful for getting giant scoops of manure and plopping them into the holding area. When it’s full, simply pull it to the field, and flip a lever. The cart then uses the rotating motion of the wheels to power a series of gears which fling the poo everywhere, and in just the right amounts. Manure should be allowed to rot for a year before spreading it, or spread it at the end of the season. I can’t express just how much work this tool has saved me, as I used to do all this work with a pitch fork ! After all of the progress in the garden, I finally got around to planting these “Black Raspberries”. My sister gave them too me last year, and they have been sitting in buckets next to my walkway. 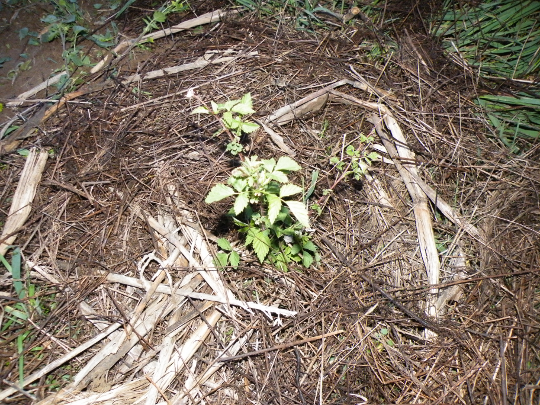 When they were in the ground, I mulched then with some straw to prevent weeds from growing nearby. To replace all of the energy I expelled during the day, I figured it was time to try out something new. In the fall of last year we bought a “half-cow” or all of the meat cuts from the animal. Since I’m not used to the names of the different cuts, it’s been a trial and error learning process about how to cook it. I like to keep things simple, so a frying pan, and some butter seemed appropriate. 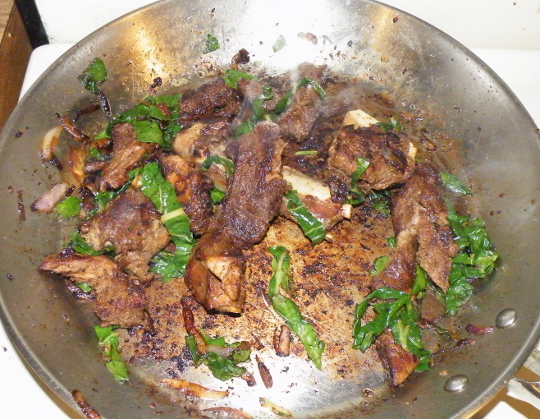 I then cut up the “English Roast” to help it cook better, and tossed in a few Stuttgarter onions from last years garden. Just as I was about to finish up, I ran out and grabbed some Chard, and added it before calling the whole concoction “edible food”. I really enjoyed the taste, so I thought I better add this to my blog so I won’t forget how it’s made.